CSUN President Dianne F. Harrison (right), who accepted CSUN's Class of 2018 IEP University Designation plaque, stands beside CSUN director of external relations Julia Potter (left). Photo courtesy of Shalin Jyotishi. CSUN President Dianne F. Harrison and Julia Potter with representatives of fellow IEP University designees. Photo courtesy of Shalin Jyotishi. 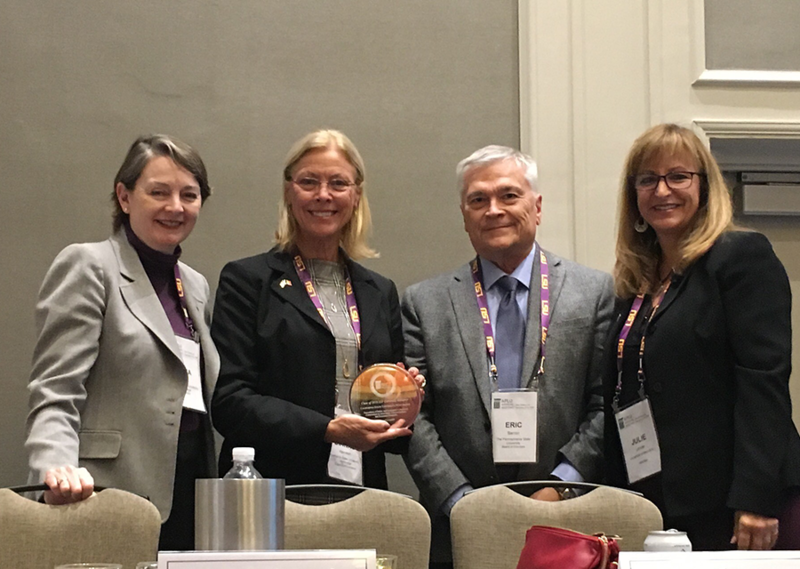 The Association of Public and Land-grant Universities (APLU) formally honored California State University, Northridge as one of its Innovation and Economic Prosperity (IEP) University Designees at its 2018 Annual Meeting in New Orleans, LA. Earning the IEP university designation places CSUN among an elite cohort of 64 institutions recognized by the Commission on Economic and Community Engagement since the IEP program launched in 2012. 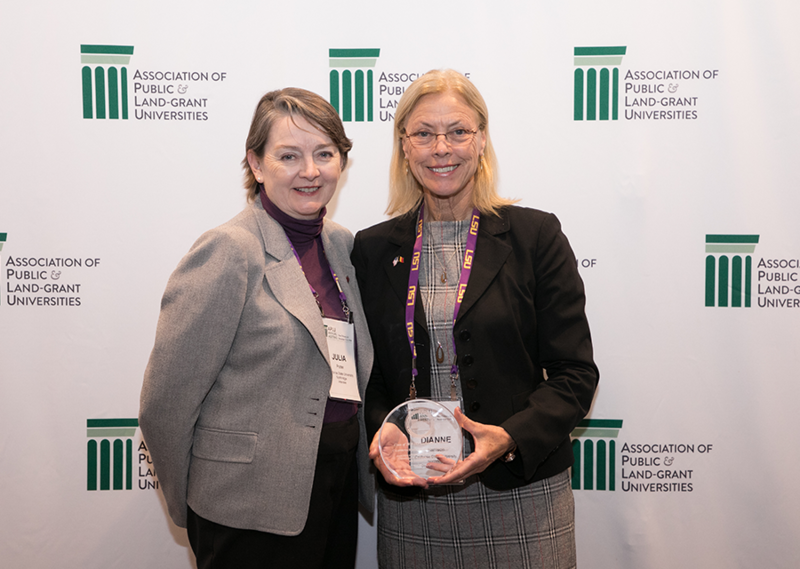 APLU, a research, policy and advocacy organization representing 130 public universities across the United States, Canada and Mexico, welcomed more than 1,500 public university leaders to its annual meeting in November. There, APLU announced its 2019 board of directors, named winners of USDA national teaching awards and officially honored the Class of 2018 IEP University Designees. CSUN President Dianne F. Harrison attended to receive the certificate on behalf of the university. The IEP designation is given to universities that have demonstrated an exemplary commitment to campus economic engagement — or the efforts to improve the economy of a target locale — through the promotion of entrepreneurship, innovation, technology, public service and the forging of partnerships with industries and the community. Applying to the IEP program involves thorough self-surveying of the university’s contributions, a process that involves noting its strengths and achievements but also areas for further development.